College tours are an awesome excuse to visit California. But really, is any excuse needed? The third time was the charm for me with my youngest son and his friend. 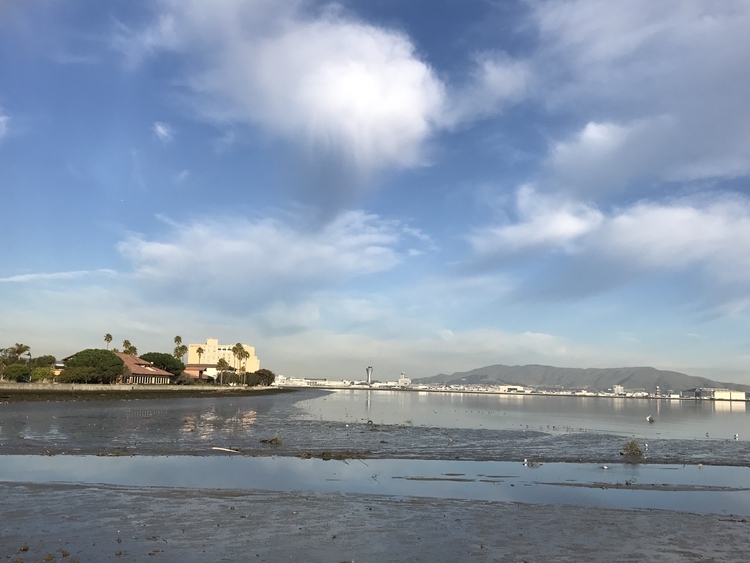 Our week-long touring plan took us from San Francisco to Los Angeles. I’m calling this our “Taste of California” tour as we toured, dined, and explored in Northern California. San Francisco was our home base for this four-day college tour that included Stanford and UC-Berkeley. Broadening a college tour to include sightseeing, exploring and fun is essential but also has to be balanced with the main reason for the trip: to give soon-to-be college students a chance to see the campus and decide whether it’s a good fit for them. Take a break from college touring. Balance is key when merging campus visits and sightseeing. Photo by Kim Orlando, Traveling Mom. Cold weather fix: turn winter break into a “necessary” trip to California to tour colleges. We took our week long February break and visited 4 of the big schools in California. For now, my son who is a junior, says he wants a big school or at least a school with a football team. With that in mind, we started our college tours at Berkeley in Northern Cali and ended our trip in Los Angeles. We traded snow for rain, which can wreak havoc on a college tour that goes rain or shine. Luckily we planned for 2 days “off” and mixed in some fun activities that were rainproof – like eating. Northern California Colleges We Toured: Stanford and UC-Berkeley. Because of this, I wanted to be situated in San Francisco with access to public transportation. The boys could easily take public transportation from Berkeley to the hotel and back to the City. TravelingMom Tip: I reserved our college tours 60 days in advance. It was a good thing I did–I had to move things around more than once. 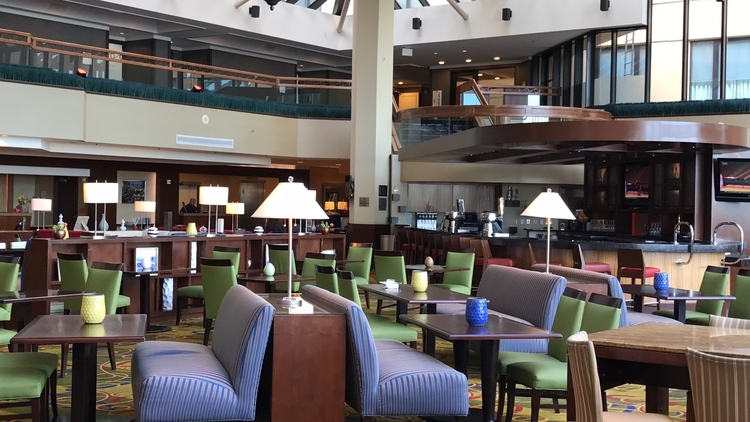 Facing the San Francisco Bay, the San Francisco Airport Marriott Waterfront with its glass walls along the waterfront is posh and polished, light and bright. I will never pre-judge an airport hotel again. We spent 4 nights at this airport hotel and the location was perfect for us since we would be traveling to Berkeley one day and Silicon Valley the next (opposite directions). But it was the atmosphere and the rooms that had us looking forward to returning to home base after hours of driving and walking. We had adjoining rooms which gave that extra level of privacy. Lounging between college tour and dinner plans is easy in the San Francisco Airport Waterfront lobby. 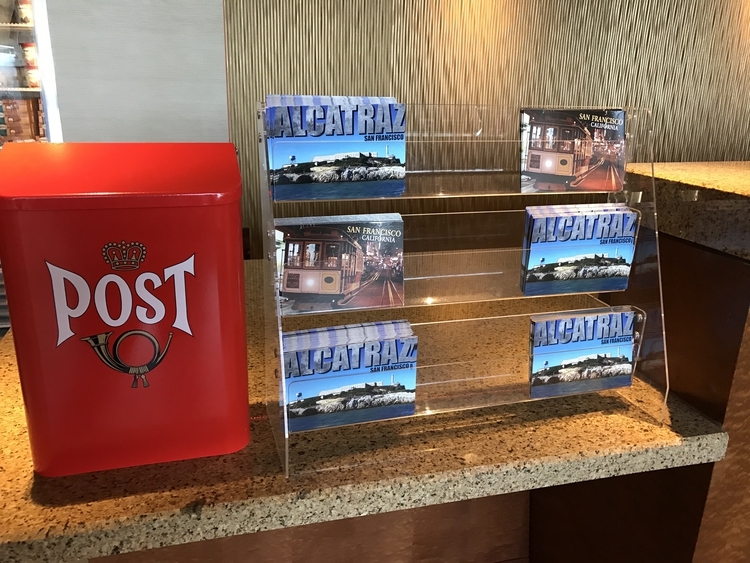 The front desk offered a “postcard station” with a small red mailbox and your choice of a San Francisco cable car or Alcatraz postcard to send. The hotel will even stamp it! I could not resist; I haven’t sent a postcard in many years and my mother-in-law and my dad were thrilled to get them. Cool idea: send a postcard back home and the Marriott will pay your postage. Photo credit: Kim Orlando/Traveling Mom. Driving in downtown San Francisco is not recommended. Gridlock is a beast. An alternative to getting around is Audi on Demand. Think luxury car rental meets ZipCar. The service is fantastic for those times when you need a car for a few hours but don’t want the overnight fees for parking. AOD delivers Audis (only in downtown San Francisco at the moment). A small Audi will run about $120 per day; a sweet and sporty S7 like the one we had costs $355 for the day. The company’s concierge service made the rental special. She delivered our car to our hotel, and spent time showing us all of the buttons, bells and whistles I might have missed–like the button to lift the rear spoiler when I was feeling extra sporty. And I felt sporty a lot. The Audi on Demand service was an unexpected hit. I loved that there were no hidden fees (tolls are covered and gas is charged with no surcharge) and it has free wifi. As of that trip, I am now an Audi fan. An S7 fan at least. That car was not on my radar until my son’s friend suggested we request it for this trip. After driving it for 4 days, I added it to my list of potential candidates for our next purchase. This service is perfect if you are staying downtown San Francisco and you need a car to jet out of town for a day or two and you do not want to waste time at a car rental agency. The time saved is worth the cost. This iconic San Francisco restaurant, made famous in The Maltese Falcon, earned rave reviews from us all. Fun trivia: the original Maltese Falcon was stolen, so a new shrine to the book remains at the restaurant. John’s Grill is three stories and while we were there, on a Monday night at 6pm, every floor was packed. The famous Jack LaLanne salad. Photo credit: Kim Orlando/Traveling Mom. Jack LaLanne had it right. 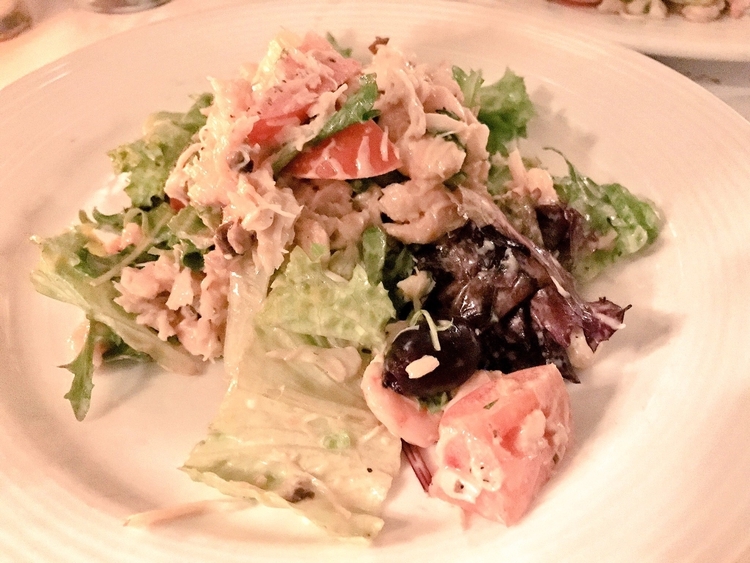 His “Favorite Salad” at John’s’ Grill is on the menu–and now it’s Kim Orlando’s favorite salad! It’s made of seasonal greens, crab, shrimp, avocado, mushrooms, and tomato tossed in creamy bleu cheese vinaigrette dressing. The most delicious and freshest salad I have eaten and I have had a LOT of greens in my lifetime. In good conscience, I could neither buy nor recommend this $28 salad unless it was truly worth it. When I return, it will be the first thing I order. I wondered how many patrons (and they were streaming in the front door) realize that John the owner was the one greeting them. He chatted with us a bit about how his parents started the business and how they select the food they serve. 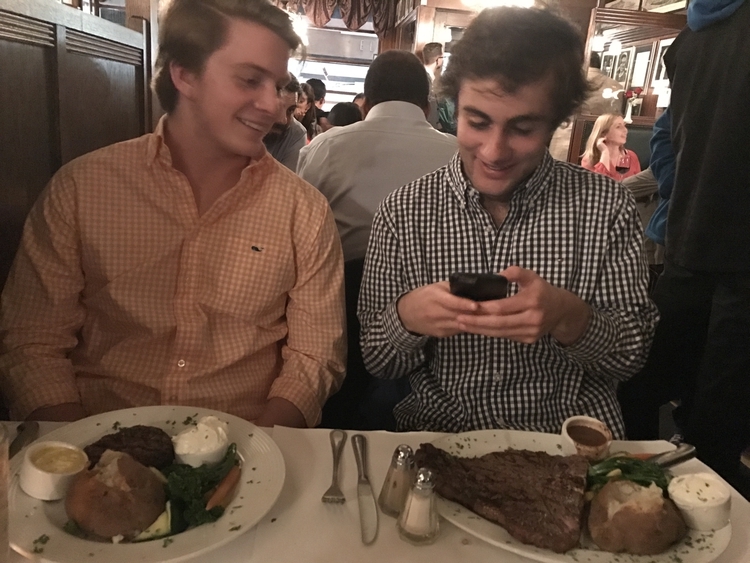 My 16 year old son took John’s suggestion and ordered the 20 oz Porterhouse steak, which he polished off. Steaks were no match for these young men. Photo credit: Kim Orlando/Traveling Mom. It’s pricey but you are get what you pay for: top quality beef and fresh seafood. John’s Grill is a family friendly restaurant that is famous for a reason: the food is phenomenal! This is key to empowering your teens to have a bit of independence is to encourage them to safely experience the city on their own. My son and his friend used their Muni Passport with CityPASS to get in and out of the city and to ride the cable cars. If we had more time in San Francisco, we could have used our CityPASS for discounted entry into the Aquarium or a Bay cruise. CityPASS is available in most major cities: Atlanta, Boston, Chicago, Dallas, Houston, New York City, Philadelphia, San Francisco, Seattle, Southern California, Tampa Bay, and Toronto. Check out our TravelingMom Deals page to grab a CityPASS and find other valuable savings on your next vacation. This walking tour combines city history and food tastings in Chinatown and North Beach, San Fran’s Little Italy. Funny thing: many of the things we tried in Chinatown were completely foreign to us, we had no clue what they were! The boys were good sports and tried everything but admitted they were looking forward to pizza at Mona Lisa in North Beach, where the tour ends. My son particularly liked The Mona Lisa because he got to speak Italian with the owner and had three espresso shots. The pizza was New York delish and if you pay a little extra, you can eat your dinner in the Mona Lisa sports car parked out front. Across the street were the most amazing cannolis you’ll find outside Brooklyn! Local Taste of the City tours are priced $ 59 per adult. 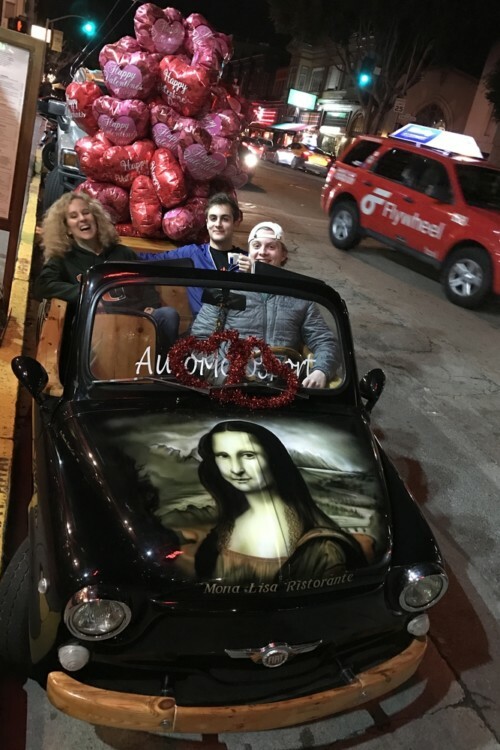 The famous Mona Lisa car, one of our stops on the Local Taste of the City tour. Photo by Kim Orlando, TravelingMom. Our guide Dominic gave us the local’s eye view of San Francisco. He knew all of the best alleys and shops to check out. And an added plus: he knew how to talk to teenage boys. Dominic kept them entertained with his animated stories about the City and everyone in Chinatown seemed to know him. The kids didn’t even know they were getting a history lesson. He was also able to make lemonade out of a stressful situation. We did not secure one of our bags (with wallet and RayBans) on the back of the bike so Dominic had to backtrack to find it. Luckily it was near our car but as we approached the bag, a car pulled up and RAN OVER the bag! Thankfully, nothing was damaged. Still, this crazy story remains a highlight of our touring. The pedicab tour was a great way to see Chinatown beyond the touristy streets. Pedicab: $95 for two people. 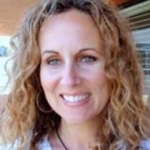 TravelingMom Tip: Don’t overplan your college tour trip. Do only one college tour a day, especially in California because traffic is unpredictable at best. When we were there it rained, which added a whole layer of traffic stress to our trip. Remember, this is not technically a true vacation because your teen is on a mission to look at schools through the lens of a prospective student. That takes time and attention. So don’t schedule other activities that will interfere with appointments and touring. I have 14 more tips for surviving college tours here. And, while we’re talking health and survival, of course I have to think about what would happen if my son were to get sick while thousands of miles away from home. I checked into Medjet, an emergency evacuation membership and their key difference is that they will send you to your hospital of CHOICE and others send you to the nearest hospital. Great for college kids who are miles and miles from home. I will fess up. Secretly I would love for one of my kids to attend school in California so that I would have an excuse to visit more often. I did my best to hold my enthusiasm in check and to keep my opinions to myself. College tours are exhausting. The tour leaders say a lot of the same things and trudging through puddles for 2 hours at USC was not fun. But none of that really mattered to me. The real point of this tour, for me, was to have a whole week with my son replacing school and sports activities and household duties with longer conversation about his dreams and goals, politics, food and a new story we can share starring just the two of us.